Currently, Jefferson County’s major employers are in the agribusiness, healthcare and public sectors. Others include transportation, light manufacturing, financial services and retail. The local workforce is diverse in culture, education and economics, drawing from two of Florida’s major universities and the multi-county Big Bend region. An ample pipeline of qualified applicants for every segment of your workforce can be recruited locally. 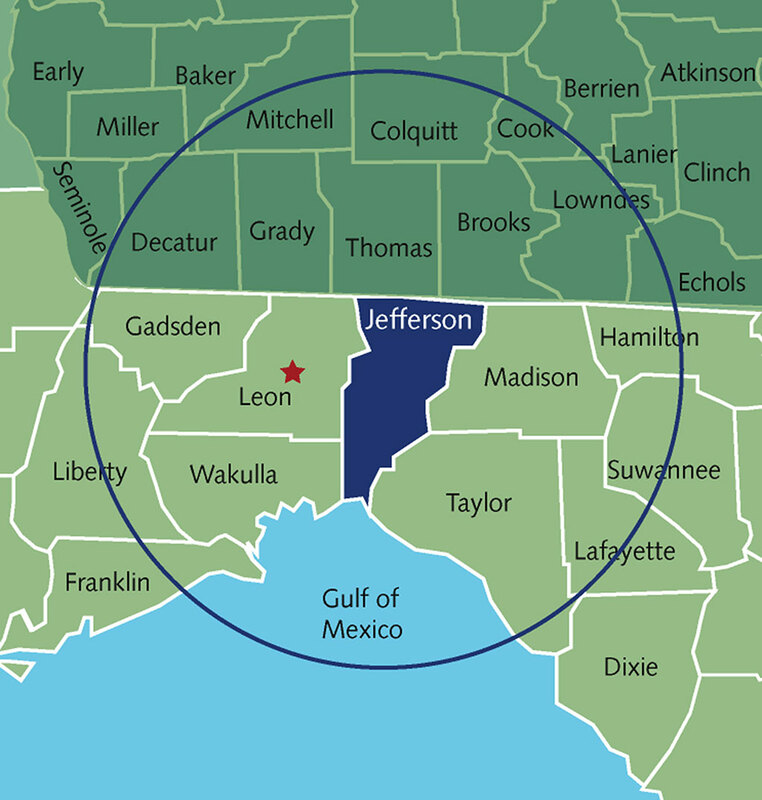 Map showing 60-mile radius around Jefferson County, FL. Click map to see detailed view. Jefferson County is part of a large labor-shed that includes neighboring cities and counties, including Tallahassee and Leon County. The overall regional workforce includes portions of the State of Georgia to the north along key routes. Close geographic proximity and excellent transportation networks in and around Jefferson County make the overall available labor force potential much greater than workers residing in Jefferson County alone. For a clearer picture of the workforce potential with the labor-shed, we examined the population of prime working age individuals (age 18-30) within three drive-time intervals. Two nationally recognized state universities, Florida State and Florida A&M, are located in Tallahassee, which along with Tallahassee Community College and Lively Vocational-Technical College, serve more than 45,000 students. Florida A&M University counts one of the country’s premiere business schools, full pharmacology and architectural programs and the International Translation Center (ITC) among its tutorial assets. Two and four-year degrees are also available at Valdosta State College (Georgia), North Florida Community College, Thomas County Community College (Georgia) and the Troy State University (Alabama) adjunct college. Vocational training is available at Thomasville Vo-Tech (Georgia) and a private business-studies school, Keiser College, offers a variety of course studies. Business and industrial researchers will find two of the world’s few “supercomputers,” a CYBER 205 and the nation’s first ETA-10, located on the Florida State University campus in Tallahassee. Along with the Supercomputer Computations Research Institute (SCRI), FSU is home of the Tandem Van de Graaf Superconducting Accelerator and the Center for Materials Research and Technology. Florida State also boasts the new National High Magnetic Field Laboratories, the only such installation in the Southeast, having beaten some stiff competition – including MIT – for this high-tech honor. CareerSource of North Florida offers a variety of services including job search help, hiring events, training grants, specialized training and more. CareerSource may be able to offset the cost of training new or existing employees. Through grants to qualified employers in the North Florida region, two customizable training options are available to fit your organization’s needs—On-the Job Training and Customized Employed Worker Training. The Florida Department of Economic Opportunity (DEO) provides information and statistics about Florida’s labor force, workforce programs and the latest employment legislation news. The Office of Economic and Demographic Research (EDR) is a research arm of the Legislature principally concerned with forecasting economic and social trends that affect policy making, revenues, and appropriations. EDR publishes all of the official economic, demographic and revenue forecasts and makes them available to the Legislature, state agencies, universities, research organizations, and the general public. Through a contract with the University of Florida, EDR arranges for annual estimates of population of each city and county in Florida. For the most up-to-date demographic reports, go to Population & Demographic Data page.